DesktopNews is an application that is advertised as a great tool that should be used to get updates on what is happening around the world in the quickest way possible. If that seems like a great program to have active on your operating system, you should know that, unfortunately, this program is, in fact, nothing more than just another adware program, which should never be active on your PC. What is rather alarming is that according to our reports quite a few users are lured into downloading and installing this intrusive program. All that this ad-supported program is capable of is causing numerous disruptions almost every time you browse the web. If you happen to already have this dubious program running on your operating system, you should take immediate measure to delete it. Use the removal guide that we provide below to remove DesktopNews in the most efficient way. The functionality of DesktopNews is rather simple as it exhibits most of the features that other ad-supported programs do. As soon as it successfully enters your operating system it will establish numerous connections to adware servers. These connections are essential for this adware program to work as such servers are the primary source of unwanted third-party web content. Generally, such web content manifests itself as various third-party ads, coupons, and pop-ups. It is important to note that all those ads and pop-ups are utterly worthless. In fact, they will only make your whole online experience an annoying and frustrating one. This is so because at times your web browser could be flooded with the unwanted content so much that surfing the web could become virtually impossible. To stop this intrusive activity entirely and to regain the standard functionality of your web browser you need to execute a complete removal of DesktopNews without any hesitation. If you fail to do so, the intrusive third-party web content will continue to bother you. While conducting our research we have discovered something much more alarming about DesktopNews than the annoyance, which it causes at all times. Our malware researchers have found out that at times this ad-supported program could present you with ads or pop-ups that could lead to exposure of your operating system to questionable third-party web content. This is so because some of the ads or pop-ups could be embedded with redirect links, meaning that just clicking on such an ad or pop-ups could take you to suspicious or even at times malicious websites. Such exposure in quite a few cases results in a system infection. It goes without saying that running DesktopNews on your operating system could have devastating outcomes. If you wish to avoid such instance, do not hesitate and delete DesktopNews right now. It is crucial to delete DesktopNews completely as it is the only way to stop all its invasive and potentially malicious features. To be sure that every single file and registry entry associated with this ad-supported program was removed from your operating system you should conduct an in-depth analysis of your operating system for potential leftovers. If you find such analysis too complicated, we recommend scanning your operating system with a reliable antimalware tool instead. 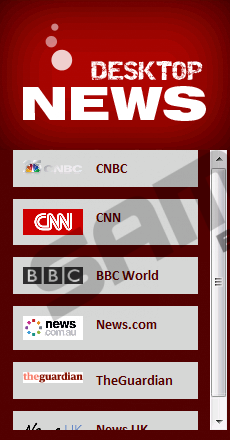 Select DesktopNews and click Uninstall. Quick & tested solution for DesktopNews removal.